The United States Equestrian Team Foundation has awarded the 2019 Amanda Pirie Warrington Grant to eventer Ryan Keefe of Sandy Spring, Maryland. The Amanda Pirie Warrington Grant is awarded through the USET Foundation Amanda Pirie Warrington Fund. Keefe, this year’s winner, has demonstrated her talent at many of the nation’s top CCI1* and CCI2* events. At just 18, and a freshman at the University of Kentucky, Keefe has piloted her top mount, Flintstar, to a number of impressive finishes, including winning the Virginia Horse Trials CCI1* in 2017 and finishing 11th overall at their first CCI2* at Fair Hill International in [Maryland] 2018. Keefe credits much of her success to her veteran partner Flintstar, who she acquired in 2016. 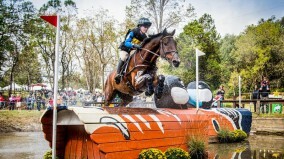 The 19-year-old Thoroughbred gelding was previously ridden by New Zealand’s Jonelle Price up through the four star level and even contributed towards New Zealand’s team bronze medal at the 2012 Olympic Games in London. In July 2018, the pair competed for the first time on the Area II CICOY2* squad at the FEI North American Youth Championships, in Kalispell, Montana, where they won team gold and placed fourth individually. Most recently, Keefe was selected to the Emerging Athlete Eventing 25 program by the U.S. Equestrian Federation Eventing Sport Committee in December 2018. The program will host its winter training session with USEF eventing emerging athlete coach Leslie Law in Ocala, Florida, from Jan. 14-17. The Amanda Pirie Warrington Fund was established by Pirie’s family in her memory with the purpose of helping to provide financial assistance to an eventing rider who has been identified as an athlete with great talent and ability to represent the United States in the future. As the recipient of the grant, Keefe, who trains with her mom, Rumsey, Sharon White of Last Frontier Eventing and Allie Knowles, will receive up to $5,000 to help offset expenses associated with her training over the next year.